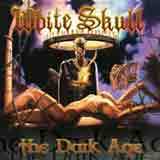 Power metallers White Skull have returned in 2002 with a new album and a new lead vocalist. The intense female lead vocals of the past have been replaced by those of Gus Gabarro. So how does the new vocalist fit with the band? Well, his style is in the same intense vein as you would expect from White Skull, although I think the band has lost some of their unique identity with this album. Musically speaking, this is a very well executed album. The drumming is tight and fast, reminding me of Grave Digger more than once. While on the topic of Grave Digger, the lead vocals of Gus Gabarro are very similar, although a little bit more clean than those of Chris Boltendahl. I like Grave Digger quite a lot, so this is not such a bad thing. For those of you who cannot stand Grave Digger style vocals, you've been warned :). I do feel that the band had a relatively unique sound of their own with the intense female lead vocals of the past. The band has lost that quality with this album and could much more easily be lumped together with many power metal bands out there. There are some symphonic elements scattered throughout the album, which give it some atmosphere without drenching it. As always, the riffing is very forceful which is always a big plus for me. Although each of the songs is energetic, there aren't many stand out moments that stick with you after the album has played through. You will not be disappointed, but this album will not knock your socks off either. As I said, the album is well played and executed and the quality level is consistent, but aside from the title track, none of the songs really stand up and demand repeated listens. Therefore, we are left with just a good power metal album: no more, no less.